You are here: Home / Healthy Aging / Should you buy organic strawberries and spinach? The 2017 list of the Dirty Dozen is out. Should we be giving up strawberries and spinach, or buying organic? One of the questions I’m most frequently asked is whether it’s worth the extra money to buy organic food. I’ve written about this in the past, and since the Environmental Working Group just recently published their annual list of the Dirty Dozen and the Clean 15, it seems like a good time for a recap. 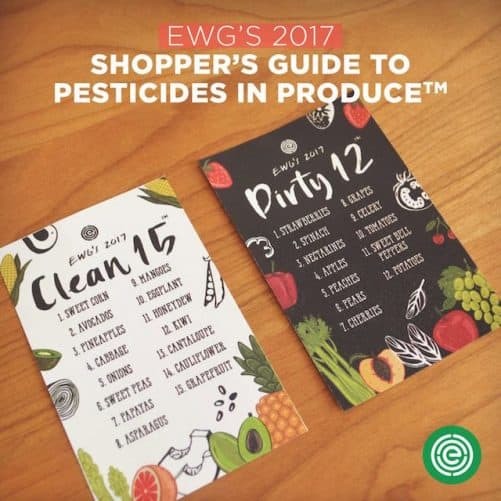 In case you’re not familiar, The Dirty Dozen and Clean 15 are lists of the top fruits and vegetables with the highest, and lowest amounts of detectable pesticide residues. This year, strawberries and spinach took the top spots. Some strawberry samples tested contained 21 different types of chemicals (including pesticides, fungicides, insecticides) many of which are linked to cancer, reproductive and developmental damage, hormone disruption and neurological problems. The test results on spinach found similar results – 16 types of chemicals were found in some batches. Seventy-five percent of the samples contained residues of the insecticide permethrin. At high doses, permethrin overwhelms the nervous system and causes tremors and seizures. In one study, children with detectable levels of permethrin in their urine were twice as likely to be diagnosed with ADHD. SO what should you do? First, don’t stop eating fruits and vegetables! SO many studies confirm that eating more helps keep you healthier, It lowers your risk of multiple types of cancer, heart disease, and diabetes, helps you to maintain a healthier weight, healthier gut, better cognitive skills and you’ll have less risk of Alzheimer’s disease … And so on. IF you can afford to buy organic, definitely do it. Not only will you be skipping out on the toxic chemicals, but you’ll also be doing something good for the environment and future generations, because organic farming methods favor sustainability. If you have to be selective, and can only buy organic some of the time (or if organic isn’t always available), follow the Dirty Dozen/Clean 15 list, and buy the Clean 15 as non-organic, and the top of the Dirty Dozen list organic. IF you can’t afford organic, don’t sweat it. Keep eating fruits and veggies because the benefits far outweigh the risks. It’s also important to get as much variety in your diet as possible. Eating non-organic strawberries and spinach once or twice each month is probably not a huge deal, but eating them every day or several times each day dramatically increases your exposure to pesticides and harmful chemicals. As you can see from the above list, there are still lots of great options on the Clean 15 list – base your fruit and vegetable choices around these, as much as possible. Another option that I find less expensive than buying organic fresh strawberries and other fruits is to keep bags of frozen fruit on hand. It works just as well in a smoothie, on dessert, in yogurt or in oatmeal. Finally, it’s always recommended that you wash produce well before eating it, but be aware the the tests done on all of the produce were done as the fruit would be eaten – that means, washed, and peeled if appropriate. Do you by organic? Some, all or none – tell me why! Great Information. Clears through the confusion. I always try to buy organic but it can be hard in the winter for berries, so sometimes I make an exception or I’ll buy the frozen organic! I think frozen berries are the best! I buy them year-round. Thanks for reading and commenting Whitney! This was so informative! I love the Clean 15 and Dirty 12 sheets as well. Very helpful! Thanks Sara! Yes, they are helpful and it’s good to know that there are lots of healthy options even if you can’t buy organic. I do use EWG and appreciate their work. Thanks! Thanks for sharing that Jessica! I think you can find issues with pretty much any food on the planet, which is why I always push the concept of moderation and lots of variety.